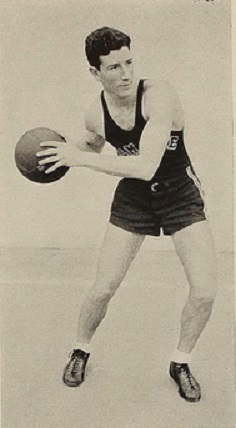 Red Rosan enjoyed his first success on the basketball court as a schoolboy star at Southern High School in Philadelphia. During three seasons at Temple University, Rosan was a versatile center- forward who stood out for his hustle and determination. In the spring of 1935, he joined the Philadelphia SPHAS for two late season games. He sat on the bench through most of the 1935-36 season, but then emerged as the team’s leading scoring the next year when he assumed a role as a starter. Rosan starred for nine full seasons with the SPHAS. Rosan was a good shooter and excellent passer, a trademark of all the SPHAS of the 1930s. He was also a standout on defense with his aggressive tactics. Rosan’s overall value to the SPHAS transcended his athletic skills. His exemplary work ethic, fiercely determined play, and intelligent, demanding leadership were one of the key elements of the SPHAS long, successful run through the 1930s and into the mid-1940s. In 1944-45, Rosan signed with Baltimore and just five games into the season, assumed the role as player-coach. The following season, he retired as a player, but remained as coach of the Baltimore franchise and led the Bullets to the American Basketball League championship, defeating his old club, the SPHAS, in the finals. Howard H. Rosan Born: May 22, 1911 Died: Sept, 1976 Hometown: South Philadelphia, Pa.